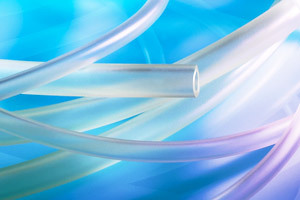 SaniPure™ 60 Biopharmaceutical tubing, the latest innovation in polymer technology from Saint-Gobain Performance Plastics, provides a clear, flexible, low-extractable, and biocompatible choice for sensitive fluid transfer applications. SaniPure™ 60 combines the features of traditional silicone tubing with unsurpassed peristaltic pump life, low permeability and absorption and the added enhancement of being heat sealable, sterile-weldable, and bondable. SaniPure™ 60 has an ultra-smooth inner bore which drastically reduces potential particle entrapment and microscopic build-up during critical fluid transfer processes. The smooth fluid path also helps facilitate complete sanitation of the fluid transfer system and improves flow characteristics by reducing surface area. SaniPure™ is a trademark of Saint-Gobain Performance Plastics.